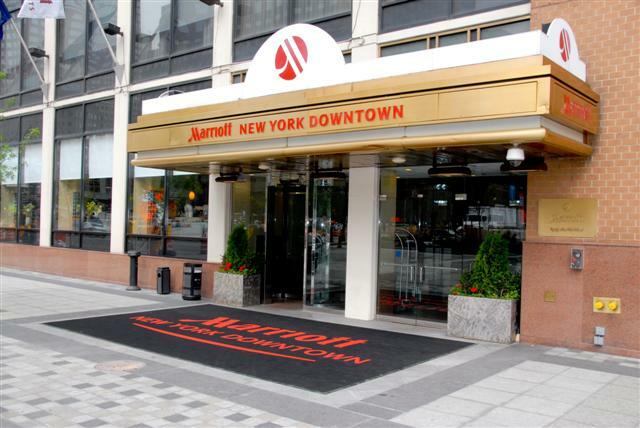 New York has no shortage of hotels that you can stay at. At almost every street corner you’ll find some sort of hotel just like you’ll find a Starbucks on every street corner in Seattle. This makes it incredibly convenient for travelers who want to stay close to major points of interest on the island. I recently took a trip to New York as a leisure relaxation adventure. I went to New York City with the express intention to visiting the World Trade Center’s observatory and checking out the Statue of Liberty and Ellis Island. Upon searching for hotels in the general area I landed on the Marriott which was on the same street corner as the World Trade Center as well as walking distance to Battery Park where I could catch the ferry out to the statue. After earlier this year getting my Chase Marriott Premier Rewards card I was loaded with just over 100,000 points and they were burning a hole in my AwardWallet. For a cool 40,000 points a night you can book a stay in their standard room right in the heart of Lower Manhattan. This is no cheap hotel either, as a category 8 you’re nearly at the top of the tier system which maxes out at category 9. I ended up booking my stay with excess points that I have earned from the 100,000 signup offer for their Chase credit card plus a couple of referrals that I managed to get for some friends that helped build up my balance. Marriott’s website is fairly clean to use and they make it easy to search for point stays. One thing to note is that you can only book basic rooms with award points and you need to call Marriott’s reservation line if you want to book a room other than the basic one, which will cost a bit more points. My flight over to New York from Seattle was a red-eye flight that got in at 7AM, after killing some time in the Delta Sky Club I lazily made my way over to the hotel around 12PM thinking that my room would probably be ready. Marriott has a great booking feature where you can request your check-in time, I hadn’t heard anything back after requesting a 12PM time but I was wrong. Upon arrival I went right up to the desk without any wait, as a Marriott Gold Elite member I have a special check-in line that got me express assistance. The staff was very friendly and welcomed me to the hotel and recognizing my elite status. My room wasn’t ready just yet and they said they would call me when the room was ready. Since I was in the Big Apple I checked my luggage with the bellhop and went out exploring going nearby to a burger shop to grab some lunch then some time walking around Battery Park. By around 3PM I made my way back to the hotel and inquired about my room only to find it had been ready since 1:30PM and they hadn’t called me. 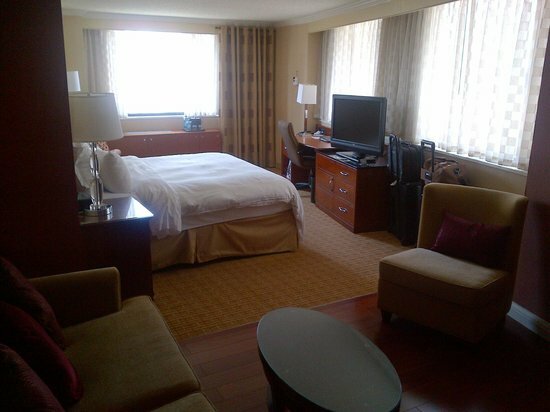 I was a little surprised however that I actually was upgraded to the Junior Suite from a King Room even though the hotel claimed they were full. Upon getting my room key I was immediately able to head up and checkout my corner room. The room was actually quite large, considering this is New York and space is at a premium when it comes to these older buildings and you are limited horizontally in space. Walking into the room it flowed from a hardwood floor to carpeted area around the bed. Even though this was a suite room it was one room with only a separate room for the bath and shower. The room could sleep four without any rollaway beds, there was the king sized bed and a pull out couch-bed. The area around the couch-bed was setup as a nice sitting area with an arm chair and coffee table. The bed portion of the room was setup nicely, you could tell the room had recently been remodeled with wood furniture and large flatscreen TV. There was storage under the TV, a mini fridge, and it flowed into a desk with an office chair, stationary, and your room’s phone. I was overall quite pleased with the room, the bed was nice and firm and the heavy bed sheets helped me get to sleep quickly. Ambient room temperature was perfect and comfortable and required no adjustment from me to get it just right while I was staying in the room. If I had to critique the room, the bed sheets had some tiny holes in them probably from age and could have used a new set, The remote wasn’t located by the TV but was oddly on the coffee table all the way near the door nowhere near or even in eyeline of the TV. The bathroom’s amenity selection wasn’t as extensive as I’ve seen in other hotels and only offered your basic shower supplies. And one other quirk that may confuse some guests is the location of the hairdryer, it’s hanging on the back of the bathroom door that you wouldn’t immediately see or notice due to the position of the door. If you’re an elite member you have two on site main dining options to pick from, in the lobby of the hotel there is a burger joint and at the very top floor there is the Concierge Lounge which is only for elite members and offers breakfast, lunch, and dinner items as well as snacks throughout the day. Additionally there is a Starbucks available in the building just off of a corridor that leads to an alley street. It’s a full service location that offers coffee and food items. 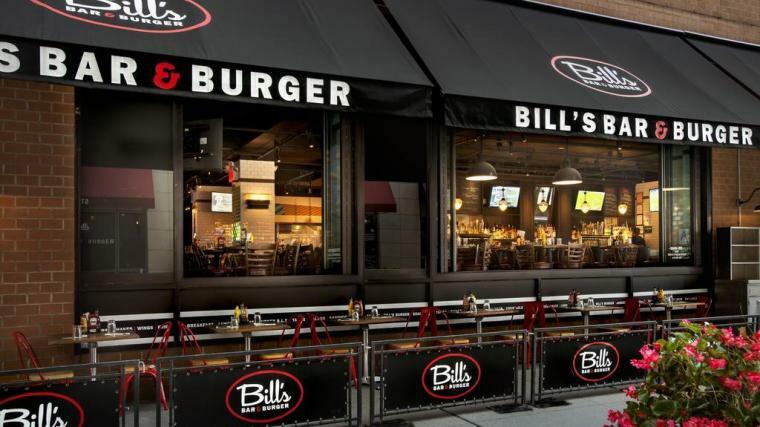 The burger joint, Bill’s Bar & Burger, had a great menu of both beef and chicken burgers with a selection of house fries or additional sides. It was extremely tasty and was open for both lunch and dinner which was nice. The place was kept quite dark and with the dark furniture it felt quite ominous. The Concierge Lounge had buffet style food set out for both breakfast, lunch, and dinner consisting of usually a hot and cold option. In the mornings they had toast, bagels, muffins, and eggs with some sort of meat option along with cereal. For dinners they had a meat and vegetarian option with assorted hot and cold sides. There was two mini fridges filled with water and assorted Pepsi products. There was also a self-service bar with mixed cocktails you could make your own and was set out as an honor system for charging a couple bucks to your room for upkeep of the hard alcoholic options. The Starbucks by the lobby was quite busy in both the mornings and afternoons and usually consisted of a line and quite the long wait if you wanted your caffeine fix. The Marriott is not really setup as a tourist location but rather a business oriented operation with options tailored for the business traveler such as taxis and limos always at the ready outside the door, business center for printing documents, and the all important fitness center. The fitness center is newly remodeled and updated featuring free-weights, cardio equipment, Virtual active™ by matrix equipment. It’s large and spacious and available to guests with their keycard. I was very impressed all around with the hotel and the room that I stayed in. While normally you don’t want to be cramped up in a hotel room all day in a city you can go out and explore in this was a great comfy place to go when the day is over. 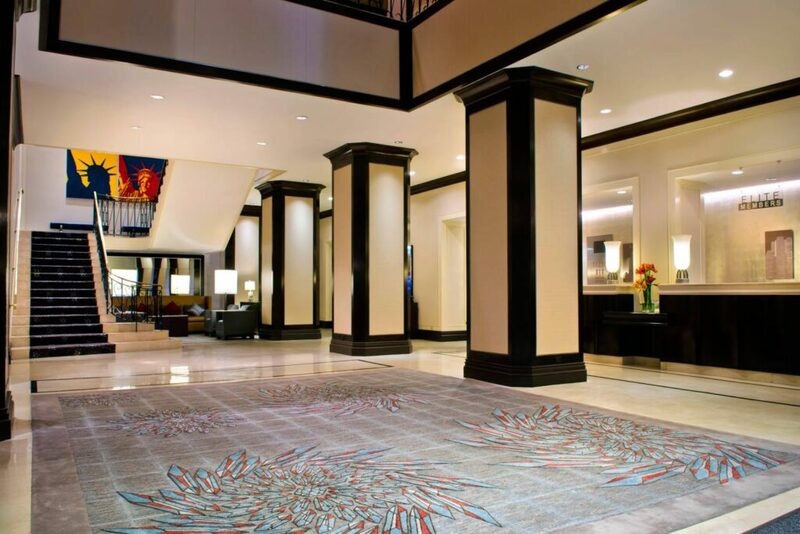 With all the features and amenities that the Marriott offers it is extremely geared towards the business travel in all respects. If I was traveling for business this would be my hotel of choice as it offers space and equipment the business traveler might need, plenty of food options, and a location that just can’t be beat if you’re needing to stay in lower Manhattan. If I was traveling for business this would be my hotel of choice as it offers space and equipment the business traveler might need, plenty of food options, and a location that just can't be beat if you're needing to stay in lower Manhattan. Next articleHow Did The SR-71 Blackbird’s Engines Work?